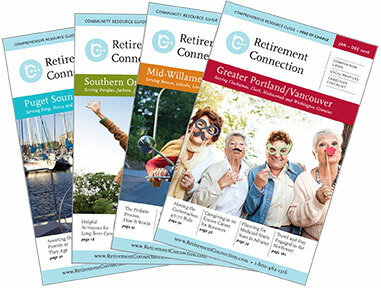 We are in the final week before printing the Puget Sound edition of Retirement Connection Guide. If you have any changes you would like to see or additions that would benefit the community, please email me right away, so that we can include those. We will send a final PDF to every housing, home health, and home care agency at the end of the week to confirm that we have your grid changes exactly how you planned. The guide continues to grow with each edition and we are so thankful for each of you that provided content for the guide or shared a copy with a family you are helping. IMPORTANT- Many people do not realize, we welcome you to add your label to the cover with "Compliments of…" and to share the guide with others. We will give you as many copies as you will use. You do not have to be a sponsor to share the guide. We want all families to have access to resources and services as soon as a need arises. Please let us know if you need additional guides. Save the dates for the Release Parties - April 24th @ Mercer Island and April 26th in Tacoma. 11 AM Taste of Sunrise Grab ‘n Go Lunch! 11 AM WMCMA presents "Managed Care Education Series: Multiple Sclerosis"
I sometimes see teams and work groups focus on annual "team building exercises". The building of a quality team doesn’t happen because you set aside a few hours once a year, it happens because you set aside time when it is needed and you know and really care about the others on your team. Then these "exercises" are just a fun time with your friends.